JC Sulzenko welcomes “For the Birds,” the 46-page collection of winning poems in the Prince Edward Point Bird Observatory’s first contest, complemented by full-colour images taken by local photographers. Published online (www.peptbo.ca) by the Observatory (PEPtBO) on January 15, the words of 17 poets and photos by Ian Dickinson and Hélène Tremblay offer a unique celebration of bird life in the County. Poems by Brian L. Flack and Walter H. Watt took the top prize in PEPtBO’s first poetry contest. “We held this contest and are publishing this beautiful chapbook online to keep a focus through the winter on the importance of bird migration and habitat to Prince Edward County, “ PEPtBO President Peter Fuller explained. JC judged the entries and edited the chapbook. “”For the Birds” features poems about songbirds and raptors, waterfowl and scavengers which honour the wonders of nature in the County in a unique way,” she added. PEPtBO will hold an award ceremony and public reading from “For the Birds” in conjunction with programming during the Spring migration period. JC led an interactive discussion of why, when and how she writes award-winning poetry under her own name or using a pseudonym. She read from her collection, South Shore Suite…Poems, which Point Petre publishing in Prince Edward County published in late 2017 (pointpetrepublishing.ca) and gave an overview of her experimental writing and experience in judging poetry contests and in editing. She also responded to questions about her use of the pseudonym A. Garnett Weiss and about the challenges of writing for children. Participants used the occasion to pour over her books and even to purchase copies. JC thanks Abbotsford House for the opportunity to speak to its members. 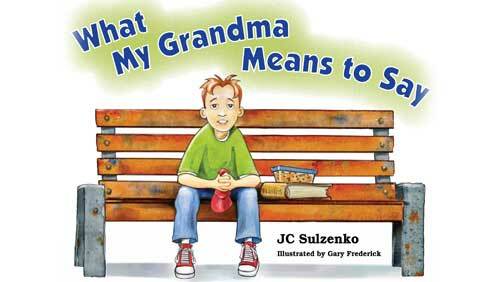 JC welcomed the September 21 launch of the Alzheimer Society of Prince Edward Island’s awareness campaign that features her book What My Grandma Means to Say and materials related to it, including the one-act play from which the book is derived. This website features a video performance of the play, as well as a PDF of the Discussion Guide which can be downloaded for free. JC explains: “I wrote the story and the play to encourage discussion among children and their families about dementia when it affects someone dear to them. “So often, adults find it hard to include kids in conversations about health issues. The story and the play enable the openness so important to children who otherwise may feel left out in the cold. 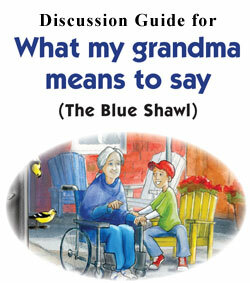 Reading it gives children the chance to learn more about dementia and to develop their own strategies for coping with changes that affect their relationship with someone living with such diseases and conditions. 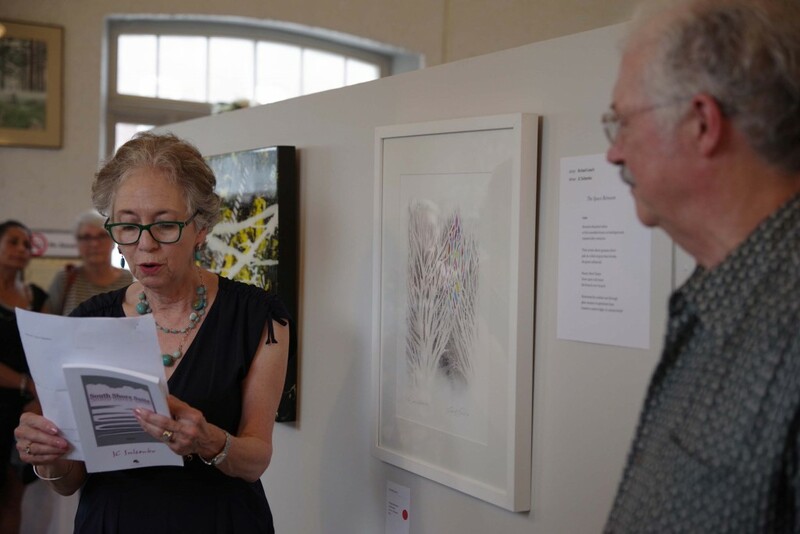 JC is delighted her poetry plays a part in the Prince Edward County (PEC) Studio Tour’s 25th Anniversary year celebration. The Tour takes place in September throughout the County. 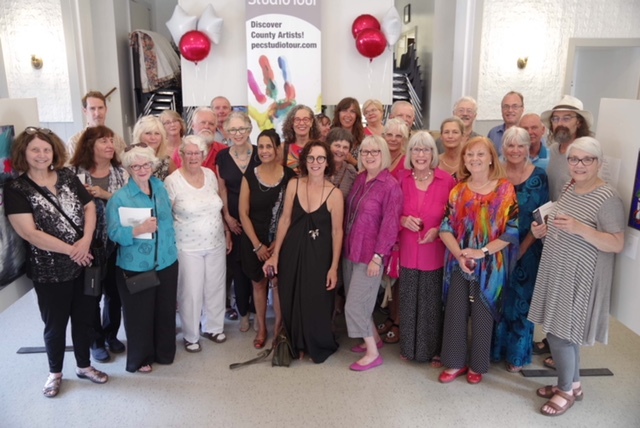 At the art show and book launch on Friday July 13 at Bloomfield’s Town Hall, JC read aloud her two poems which evolved from artwork by members of the Studio Tour. “Lens,” based on Richard Leach’s mixed media-gliclee print, “The Space Between,” and “Where Chagall met Gaugin and Dali,” arising from Holly Sedgwick’s acrylic “Sun Dance,” appear in the commemorative book published to mark this unique ekphrastic collaboration between County artists and writers. Another chance to see this work followed on the weekend of August 11-12 at Wellington’s Town Hall. JC was delighted by the lively discussion that included a romp through selections of poems from Rupi Kaur’s two, best-seller collections of poems. 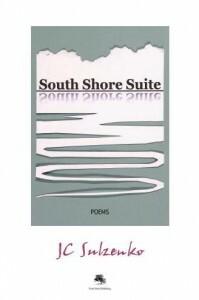 JC read from her first, full poetry collection, South Shore Suite…POEMS, which came out in November (www.pointpetrepublishing.ca) and touched on aspects of her writing life from works for children to self-publishing, from writing collaboratively to assuming a pseudonym. She has been working together with Carleton Place poet Carol A. Stephen for about 5 years. They have published two chapbooks, Breathing Mutable Air and Slant of Light, the latter all poems inspired by works of art. “Carol and I are finalizing the manuscript of a full collection of ekphrastic poems to send out to publishers.” The works from which these poems depart include sculpture, multimedia, textile and visual art. This is the second year JC worked on the project, which lists some 24 events ranging from bird walks, excursions and tours to a 100 km. bicycle ride, from fish fries to graveyard walks, from fishing derbies to fossil hunts. “Nature Matters!” has been published online at www.peptbo.ca. 7000 hard copies of the glossy book will be available throughout the County starting in April. The booklet also launched a poetry contest for a chapbook PEPtBO will publish on its website.”For the Birds” invites poets aged 9-16 and adult poets living in or visiting the County to send in poems that relate in some way to birds native to the County or migrating through it. Specific information on the contest appears in “Nature Matters!” on line and in print. JC has been reading steadily but not caught up on her mini-reviews, which use up to the same number of words as characters for a tweet. Go to “Bookends” to read her review of Prince Edward County author, poet and artist Peter Blendell’s “Jonagold,” published in 2014.
that churn songs and soft feathers.